These policies are loaded with commissions and expenses. There’s not much clarity about the returns either. It is too late by the time you wake up; getting out of such policies is not only difficult but also an expensive affair. The expenses and commission part is usually hidden and the same can eat into your returns over the years. 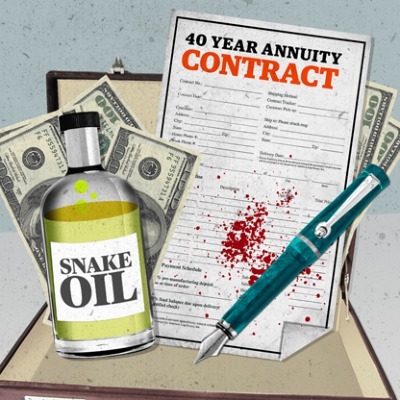 You would notice the annuity and life insurance ads very often during financial markets downturn e.g. crisis of 2008 when everybody was running to safety. The “Guaranteed Return” (regardless of how low it is) seem to be an ideal choice in uncertain times. Not only that, some of the best ads are of Insurance companies: creative, funny and emotional. It is easy to get swayed into buying these. Most of the banks now have “Wealth Management” section or a subsidiary. It wasn’t necessarily the case..say 10 or 20 years ago. I noticed this trend recently in Australia and other Asian countries as well. The Wealth Management has become the new revenue stream for banks and selling has become aggressive. The last word: Insurance in not an Investment, it is meant for Insurance purpose only. A Term policy is all that you need to safeguard yourself and your family in this lifetime. Ignore the slick sales gimmicks of guaranteed life, life insurance for children, travel and accident insurance, and whole life/universal life etc etc. As far as Investment/Return is concerned, one is better off using the extra money in index (or diversified) MFs that are No Load and have the least Expense Ratio. If you want to read up more on the same subject, there are some good videos by Dave Ramsey and Suze Orman on youtube. This entry was posted in Get Rich and tagged Investing, Life Insurance, Money, personal finance, Term Insurance on July 19, 2013 by admin.